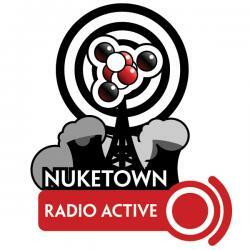 The first edition of Nuketown Radio Active, the ol’thermonuclear’s podcast, is available for download. The podcast includes a review of Neal Stephenson’s cyberpunk novel Snow Crash, speculations on the need for Marvel’s 10th anniversary Age of Apocalypse mini-series, thoughts on Elements of Style applied to e-mail, and a quick review of The Incredibles movie and soundtrack, which is about to be released on DVD. I plan to post new episodes of Radio Active every week or two. Comments–particularly audio comments–about the podcast are always welcome, and can be sent to nuketown@gmail.com (which should have more than enough space to handle any audio notes). Host: Ken Newquist. Editor at Nuketown, freelance writer for SCI-FI.com and Knights of the Dinner Table, married for nearly 8 years, dad of a two-year-old named Jodan, and an and all-around geek. A discussion about Snow Crash by Neal Stephenson. It’s a cyberpunk novel set in a futuristic America in which the country has been balkanized into corporate enclaves and well-defended suburbs. The “Deliverator” opener is one of the best in science fiction. One of the most intense and descriptive narratives I’ve ever read, yet about something so fundamentally unimportant. Stephenson manages to turn delivering a pizza from just another crappy job into a life or death struggle a personal quest for honor rivaling that of the most dedicated samurai. Will we ever see “virtual” worlds for accessing information? It seems unlikely until we come up with a system that’s faster than typing for bringing up sites and sorting information. Right now, the visual metaphor actually takes more time to get your brain around than the text one. Then again, such a tool may be useful as we start trying to search through more and more audio and video feeds. Tenth Anniversary of the Marvel limited series that killed off Professor Xavier and gave rise to a human-slaughtering tyrant named Apocalypse. Marvel has released a one-shot and 6-part mini series revisiting the setting, but is it worth returning to? Lately I’ve begun to feel that my writing style is stagnating because I’m not challenging myself enough. I’m forcing myself to write to a specific word count on Nuketown. One of these is The Elements of Style by William Strunk and E.B. White. It’s a small, concise book that provides a quick-yet-accurate rundown of important grammar rules and common writing mistakes (like forgetting that all singular possessive nouns should have an ‘s on the end, regardless of whether they end with an “s”. Given that my last really-intensive grammar lessons came in high school (if not middle school), this is a welcome refresher. On a related note, Elements of Style specifically noted that it wasn’t going to talk about e-mail because of it’s inherently conversational nature. I think we’ve become too lax in writing e-mails — some people aren’t making even a minimal effort to be coherent, abandoning any and all grammar rules. If you’re going to spend time writing an e-mail — and ask me to spend time reading it — isn’t it worth it to make sure that it’s at least understandable? The Incredibles arrives on DVD on March 15, and I’ll be buying it as soon as possible. I loved the superhero storyline, but loved the subtext even more — not very many films advocate fighting back against mediocrity. I picked up The Incredibles soundtrack via the iTunes Music Store. It’s a fun CD full of retro-60s spy music. Makes for nice background for coding or writing at work.